Bitter gourd might not be a favourite of many due to the bitterness of this gourd. I used to shun it till I found out how much nutrients it contains; and it is also low in calories!! However, if you are already a bitter gourd lover, then you are in for a treat!! First, the fish is fried to seal in the juiciness of the meat. 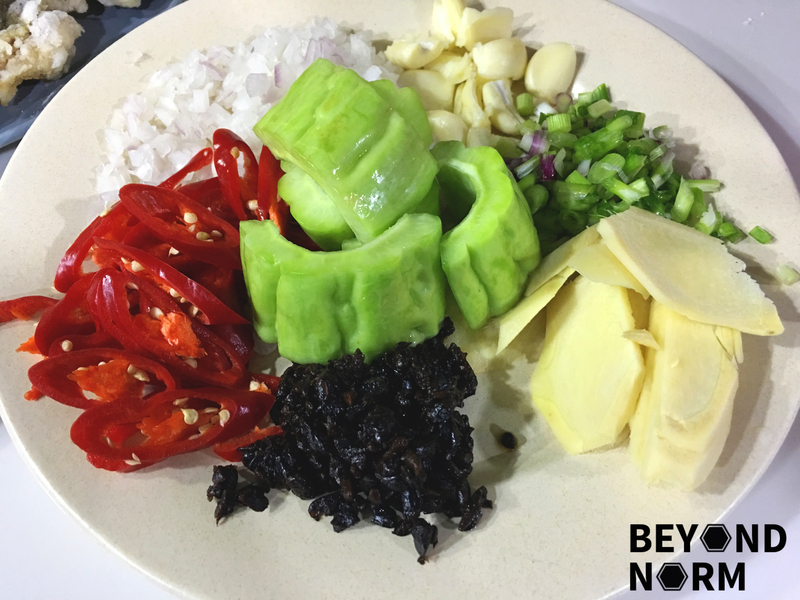 Then it is braised with loads of garlic, ginger, red onions and black fermented bean sauce, and lastly topped with spring onions and red chillies. I always had the notion that cooking this dish is very difficult, but once I changed my mindset and attempted it, I overcomed my own fear. At this point, I won’t say is an “easy peasy” dish but a manageable dish to conquer if you want to. I can only describe this dish by simply saying it in Chinese, “HAO CHI”! (好吃! ); which means tasty or palatable. I hope you like this dish as much as we do! Give us some comments or feedback via our blog. We would also like to invite you to join our Mummy’s Kitchen Facebook Group for food lovers, whether you are newbies or veterans. 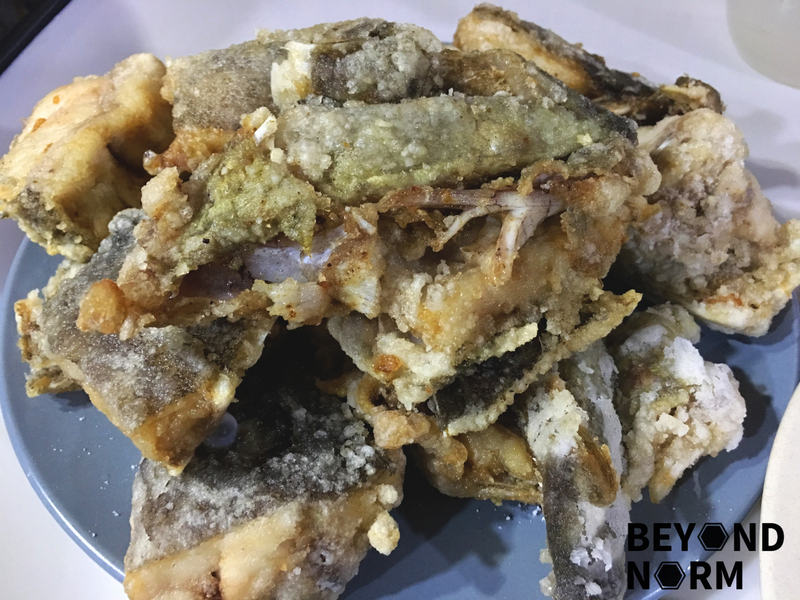 You can like us on Beyond Norm’s Facebook Page and subscribe to our blog and Instagram @beyondnormblog to get the latest updates. If you love videos subscribe to our YouTube channel @beyondnormblog. Can you smell the aroma that is exuding from the pot of braised fish head? It is making me hungry now! Add 3 tablespoons of salt and rub it all over the fish pieces. Then rinse off with water and remove all the blood and impurities. Drain and marinate the fish head pieces for at least 30 minutes or longer. Lightly coat the marinated fish head slices with potato flour. Shake off the excess flour. In batches, place the fish pieces into the oil and fry till golden brown. Cut the white part of the spring onions into small pieces and cut the green parts into 2 inches in length. Set aside. Cut the bitter gourd into half, lengthwise. Scrap off the seeds by using a metal spoon. Cut the bitter gourd into slices. Rub all the pieces with 1 tablespoons of salt for about 10 minutes. Then rinse and drain and set aside. Heat up the 5 tablespoons of oil. Add in the ginger, garlic, white part of the spring onion and red onions. Fry till fragrant. Add in the fermented black beans and stir for another minute. 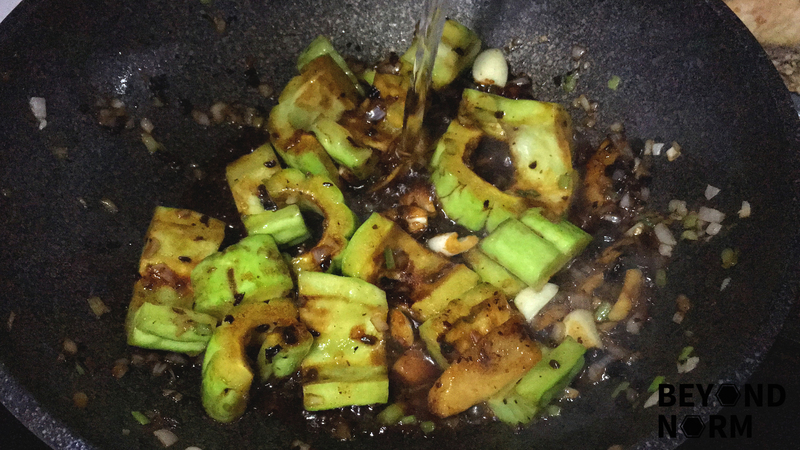 Add in the light soya sauce, dark soya sauce, oyster sauce, fish sauce and sugar. Mix well. Add in the bitter gourd and ensure that they are well coated with the sauce. Add in the water and simmer for 2 to 3 minutes, cover with a lid. Now add in the pieces of fried fish head. Give it a mix or two before glazing it with 4 tablespoons of Shaoxing wine. Cover and simmer for another 2 to 3 minutes or until the bitter gourd is cooked through. Next add the spring onions and sliced red chillies. Mix well. Cover and let the dish rest for 2 minutes before serving. Dish and pour 1 tablespoon of Shaoxing wine and serve with steamed rice. If you want the dish to be spicy, add the chillies in Step 20 and use bird eye chillies instead of the big red chillies. 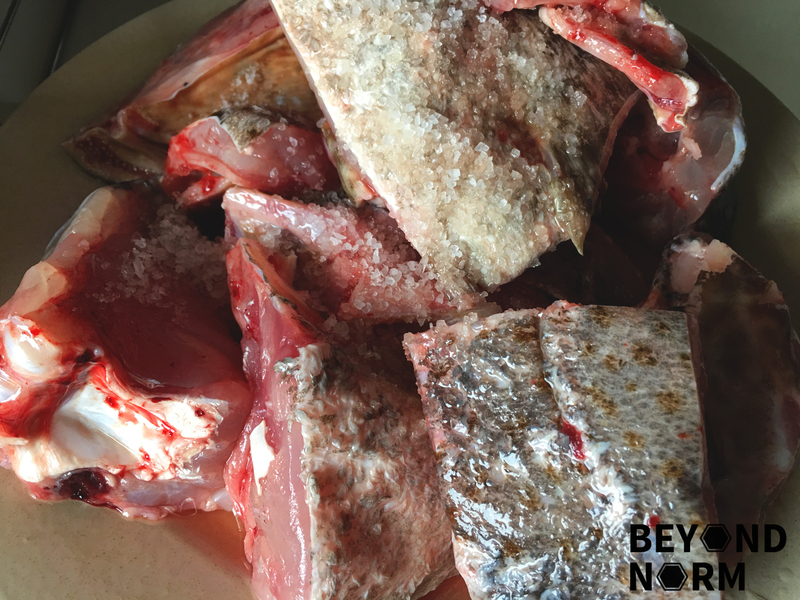 Thank you for sharing this…my grandson loves fish heads, in fact, he leaves very little on a fish or meat when he eats…lol..Typical Thai waste nothing!…lol…I have not cooked them as a dish though but I am sure it will be well received.. Previous PostFood Review: The Peranakan – No MSG. Just plenty of old fashioned TLC.